Home Tags Posts tagged with "Breastfeeding-Friendly Campus initiative"
State law protects the rights of women who wish to breastfeed or express breast milk at their place of employment, during breaks and in private spaces designated for these purposes. But students are not protected by the workplace law, Vancour points out. “The culture is different for students from employees,” she says. “As a result of unequal access to supports, students are forced to leave school, miss classes, or pump milk in unsafe environments like bathrooms and cars.” The Breastfeeding-Friendly Campus initiative broadens support to include students and even visitors to campus who may wish to breastfeed or express breast milk. The designation certainly “sends a signal about what kind of campus we are,” says Terricita Sass, associate vice president for enrollment management, who is a volunteer Breastfeeding Champion. Vancour believes that Southern can serve as a model for other campuses around the country and in fact has been contacted by individuals at other universities who are working towards attaining the Breastfeeding-Friendly designation. Read an article in the Washington Post about Southern’s designation as a Breastfeeding-Friendly Campus. Southern recognizes the importance of creating a family-friendly environment for students, employees, and the community, and as such aims to provide a supportive and flexible environment for breastfeeding students and employees as they transition back to study or work. Breastfeeding is known to offer health benefits for both infants and mothers, but mothers who are nursing their babies often encounter obstacles to continuing the practice once they return to work or school. For women in the Southern community who are breastfeeding their babies, a new campus-wide initiative will ensure an environment that is supportive of breastfeeding. 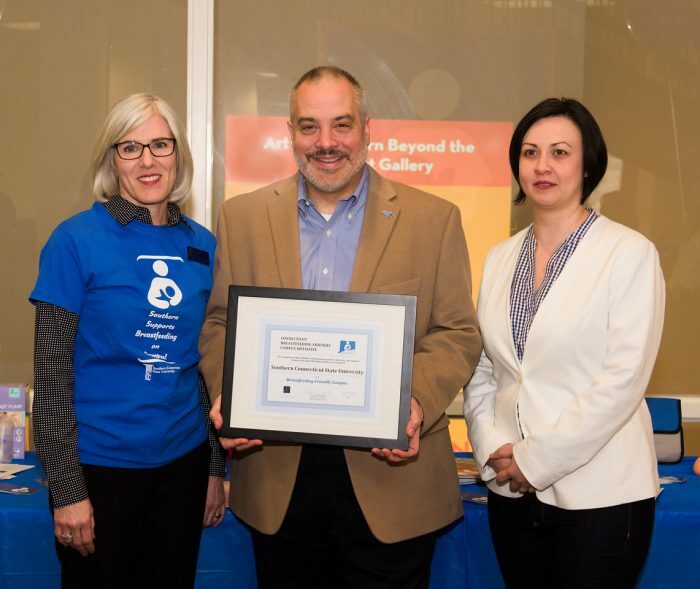 Southern is in the process of becoming a “Breastfeeding-Friendly Campus,” a designation given by the Connecticut Breastfeeding Coalition to recognize higher-education worksites that are supporting breastfeeding employees and students. As part of becoming a Breastfeeding-Friendly Campus, the university now expects each department to take reasonable measures to accommodate students and employees who wish to breastfeed or express breast milk on campus in accordance with Connecticut State Breastfeeding Laws. State law protects the rights of women who wish to breastfeed or express breast milk at their place of employment, during breaks and in private spaces designated for these purposes. But students are not protected by the workplace law, points out Michele Vancour, professor of public health and director of the Office of Faculty Development. “The culture is different for students from employees,” she says. “As a result of unequal access to supports, students are forced to leave school, miss classes, or pump milk in unsafe environments like bathrooms and cars.” The Breastfeeding-Friendly Campus initiative broadens support to include students and even visitors to campus who may wish to breastfeed or express breast milk. 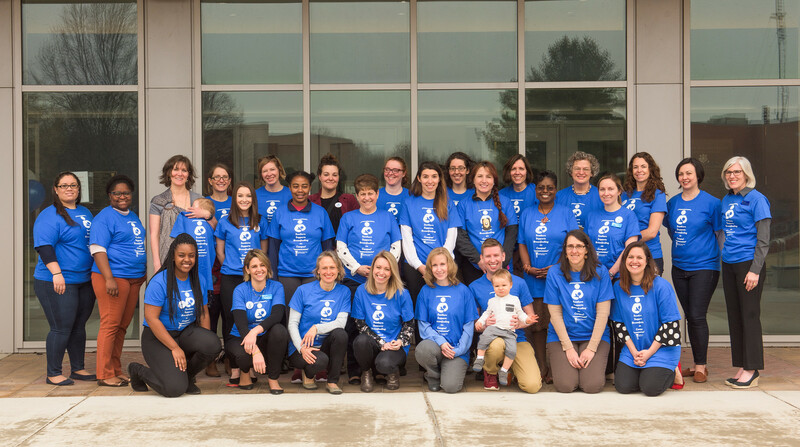 In August, the School of Health and Human Services (HHS) officially became a pilot program as a “Breastfeeding-Friendly School,” and now the initiative is branching out to the whole campus. Vancour has been leading the charge to bring this program to the university. As immediate past president of the Connecticut Breastfeeding Coalition and co-author with Michele Griswold of the book Breastfeeding Best Practices in Higher Education, Vancour has long been a champion of making the campus more friendly to breastfeeding mothers and was behind the effort to establish the university’s first lactation space (in Conn Hall) and a newer space in Buley Library. “We’re the first university campus in Connecticut, and probably in the country, to do this,” Vancour says of the Breastfeeding-Friendly Campus designation. She explains that the goal for the initiative is for each department to have a “Breastfeeding Champion,” someone who knows how best to support a mother who comes to them looking for information on lactation spaces. Each champion will receive a packet of information and a sticker to display that shows she or he is a champion and will know who else can help and what spaces around campus are available for moms to pump in or breastfeed. Vancour is available to provide a brief presentation at department meetings on the multi-user lactation space in Buley and the overall Breastfeeding-Friendly Campus initiative. She points out that the Office of Faculty Development website has links to a video of the multi-user lactation space in BU 117; a registration form for all breastfeeding mothers on campus; and a room reservation form for BU 117. To become a champion or for more information, contact Vancour at (203) 392-5530, (203) 392-5488, or vancourm1@southernct.edu.